It's getting more and more difficult to keep up with the collection of portable gaming devices collectively known as the Nintendo 3DS family - Nintendo just launched a brand new device, which means you can now choose from four models for your next purchase. Here we're going to run through the key differences between them - these then are the four handheld gaming devices you can still buy from Nintendo or popular online retailers (if you really want to collect them all, older versions can be purchased second-hand). There are some similarities between all these four models - they all play the same roster of games (though without 3D in some cases), they all have a stylus and front and back cameras, and they all (usually) come with a 4 GB memory card and a game of your choice. In short: the oldest, most basic, and cheapest option. The 2DS was announced in 2013 - that's later than the the original 3DS and 3DS XL, but those two devices have since been revamped, so the 2DS comes first in our list and is currently the oldest of these models that Nintendo still sells direct. Confused yet? It's not actually that confusing once you dig into it: the 2DS is a more basic model particularly suitable for younger kids, because it's the only model without a clamshell design, and therefore more robust. It's also the cheapest option. The top screen is 3.53 inches, with a 400 x 240 pixel resolution, while the lower one is 3.02 inches and has a 320 x 240 pixel resolution. The device is fitted with a 268 MHz dual-core and a 134 MHz single-core processor, plus 128 MB of on-board storage. Of course there's no stereoscopic 3D here, as the name suggests, so you can't take advantage of that particular gimmick, and there's no Amiibo support either. Despite the lower specs and smaller screen, the 2DS can run all the games the other devices can, without the 3D support. It's available for £79.99 in the UK or $79.99 in the US. 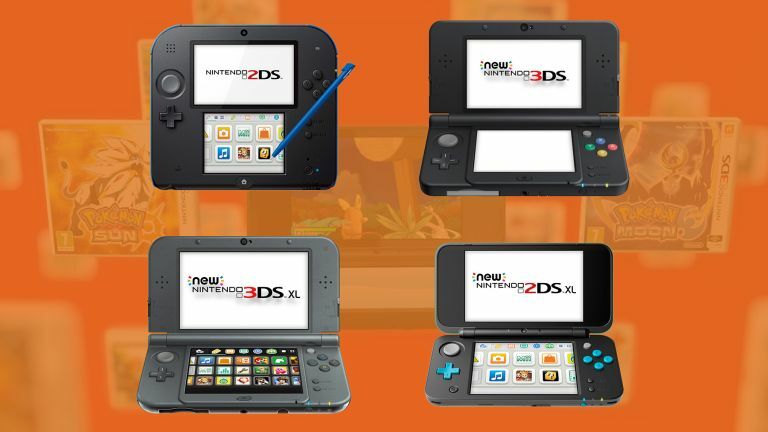 In short: the original 3DS, improved. The Nintendo 3DS was actually the first of these devices to appear, back in 2012, but the version you can buy today is an updated 2014 edition with an improved design and some upgraded specs. If you want the 3D stereoscopic capabilities on your handheld, this is the smallest and least expensive option. You get an 804 MHz quad-core and a 134 MHz single-core processor to power your games. The screens are a 3.88-inch, 800 x 240 pixel one on top, and a 3.33-inch, 320 x 240 pixel one on the bottom, and there's 256 MB of on-board storage. This new 3DS added a second analog stick for improved control, called the C-Stick, which is one improvement over the 2DS (it's not essential, but it helps in certain games). It also changes the memory card format from SD to microSD, which isn't a particularly huge deal. With not many gamers actually caring for the glasses-free, 3D stereoscopic effects of the Nintendo 3DS, this model and its XL sibling are under threat from the brand new 2D XL. You can still get the "new" 3DS for £149.99 in the UK, though US availability is limited. In short: the largest, most expensive, full-fat 3D model. So above we have the smaller models - 2D and 3D versions - and next we have the XL pair of handhelds, larger versions of each. Well, sort of, anyway. This model was released at the same time as the "new", revamped 3DS in 2014, and it's basically just a bigger version. That translates to larger screens: 4.88 inches on top and 4.18 inches on the bottom, though the resolutions stay the same as the 3DS, at 800 x 240 pixels and 320 x 240 pixels respectively. Of course 3D stereoscopic effects are supported, if you want them. The internal specs are the same as the 3DS, and you get the same amount of internal storage, so everything should run as smoothly as on the smaller model. You might lose a little in the way of battery life, with those larger screens to power. You can think of this as the "top end" model in the range, though the new 2DS XL is lighter and looks funkier. Essentially the only reason to go for this older model instead would be if you want the 3D effects included. You can pick up a device for £179.99 in the UK, though again official stock is running low in the US - $170 will get you a refurbished one direct from Nintendo. Nintendo Classic Mini review: Is this micro NES all it's cracked up to be? In short: the shiny new addition to the family. Nintendo's newest device in this particular group is arriving in the UK at the end of July, and you're basically getting a slightly cleaner looking device that's lighter and cheaper than the 3DS XL, but one that doesn't have the 3D stereoscopic graphics. At the time of writing Nintendo hasn't released the exact specifications for the 2DS XL but we expect them to be very similar to the 3DS XL. The controls are certainly the same, and you get the same C-stick input upgrade over the original 2DS. Amiibo support has been added too, which didn't come with the first 2DS. The new 2DS XL also adopts the same clamshell design as the 3DS and the 3DS XL, which is another break from the 2DS that came before it. One final upgrade over the 2DS is the introduction of stereo speakers. The 2DS XL is one device that'll definitely be coming to the US at a price point of $149.99. At the moment there's no confirmed price for the UK, however retailer GAME has the system listed right now for a pre-order price of £132.99.